These are the show notes to an audio episode. You can listen online right here by clicking: http://media.libsyn.com/media/airspeed/AirspeedCitabria1.mp3. Got up in the Citabria yesterday for a training flight. 1.4 hours of mostly aerobatics and landings. The plan was to go out, review the maneuvers that I’ve been working on up until now, and then do some spins, sort of as a killproofing exercise. The aerobatics worked out well. Wingovers, loops, rolls, and hammerheads. Last time, I was at the point where the loop was mine. I flew them more or less without coaching (at least after a little review and coaching on the first one or two). This time, I added the hammerhead to that category. I’m getting good vertical uplines and downlines and handling them with good energy management (e.g. I get a good amount of time in some of the more dramatic accelerative phases while still recovering in plenty of time to keep the airspeed well within the design tolerances of the aircraft). I’m really pretty proud of that. Same with the rolls. A roll in the Citabria involves picking up energy with a dive to about 120 MPH IAS, leveling out briefly, and then burying the ailerons left. You roll 360 degrees, pulling power smoothly throughout, and then you end up wings-level on a 45-degree downline (which you maintain for awhile), and then you recover. You lose a lot of altitude (500 feet or so) pretty quickly, which was news to me when we started, but it’s actually a very elegant move. You get and then give energy in an elegant, disciplined, precise, and measured way. Inversion tends to bother me, even when I’m on the controls, and, by the time we got to the spin part, I was pretty green. Barry gave me a pretty good lecture and demonstration of what secondary stalls can look like in likely scenarios. Still technically under control, but oscillating toward departure from controlled flight. We did one sustained falling-leaf stall, broke it, and pulled way-nose-high into a secondary stall, which, in turn, broke more savagely and dropped a wing hard. I’m sure that the third iteration would have been even more violent and that was the point of the exercise. Barry’s teaching is really well-structured in that he always starts out with the reason that he’s teaching what he’s teaching and, if possible, a demonstration of how the maneuver applies in actual situations. Just when we were ready in the training sequence for the actual spins, my tummy informed me that it had had enough. Discretion is the better part of valor, even though I had a Sic-Sack in my pocket and ready to go. I’ll get the spins in later this fall. We headed back to the airport and got in four or five three-point landings. I was really pleased with the landings this time. I think I’m finally getting over one of the bad habits that plagues tricycle-gear pilots transitioning to tailwheel. I’ve been relaxing the back pressure on the stick after touchdown in much the way a tricycle-gear pilot would do to lower the nosewheel. In a tailwheel, you want to get the tailwheel down and keep it down. It both keeps the tail from oscillating and gets the steerable tailwheel down on the ground where it’s effective. Although I ballooned the last flare pretty badly, the landing worked out well and all of the landings had much more of a feel of positive control than I had experienced before. Very nice! I think I’m getting it. I realize that wheel landings will be another matter entirely, but I’ll revel in such success as I’ve had so far. I took Cole and Ella out to see the Citabria earlier in the day. 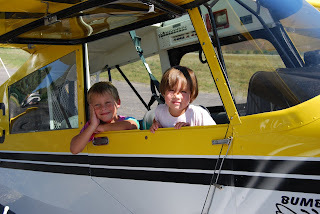 I don’t think I’ve ever had then in a taildragger before and they really seemed to like the tandem seating. 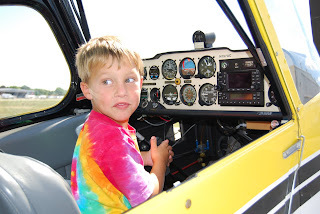 Cole is really beginning to understand how the flight controls work. I can tell because, when he moves the controls, he looks right at the relevant control surface without casting about. You can see in this picture that he’s pulling and looking back at the elevator. Ella, starting out in the back seat, expressed a little consternation about the stick moving around, apparently unbidden, as Cole worked the controls in front. She happily rotated up front and really seemed to enjoy seeing the different cockpit configuration. And here’s the coolest part of the day. The Citabria is owned by one of the instructors at Sutton Aviation and he leases it back to the school. He happened to be walking out on the ramp with a student and noticed me taking pictures of the kids in the Citabria. He knows that I’ve been training with Barry and I had ducked in when I arrived to make sure that it was okay to show the kids the aircraft. He also knows that I have a tailwheel endorsement from the DC-3 training, but that I’m conservative enough to come back for more training from Barry in the Citabria in order to really learn the ins and outs of conventional-gear aircraft. “Hey, why don’t you start it up and taxi the kids around the ramp a bit? I’ll bet they’d love that.” They’d love that? I’d love that! My wife is wonderful and has been very tolerant of my flight training. Especially considering at least one event involving an instructor during my primary training. Even when I started taking aerobatic training, she didn’t object and she listened objectively when I explained the additional margin of safety that upset recovery and related training adds to regular GA flying. Heck, I had had thought long and hard myself about it before talking about it with her. She’s not nuts about the idea of me flying the kids just yet. 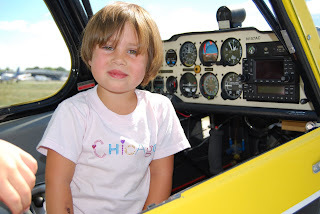 She approved getting up for a helicopter flight at Oshkosh and also said that it’d be okay to take Cole along if a spot had opened up in the back of the Herpa DC-3 (although she asked a lot of questions about Dan Gryder, all of which were easy to answer). But she’s still getting comfortable with the idea of me flying Cole or Ella. In the meantime, I honor her feelings. I take the kids to the airport regularly and we ramp-fly whatever’s on the line, but they’ve never been in a GA aircraft with the prop turning. That’s why this was such a cool opportunity. You normally wouldn’t go through the trouble of starting up an airplane and taxiing it around if you weren’t going to fly it. It had not even occurred to me to do it. But now we had a quiet ramp in a sleepy little corner of the airport. Plenty of room to taxi around and a gorgeous little taildragger in which to do it. I got them in the back seat, buckled everybody in, ran through the startup checklist, and hit the starter button. The prop turned through about 20 blades and then the engine fired to life. I looked over my shoulder and they were both smiling from ear to ear. Any worry that either of them would be scared by the noise or uncomfortable in the airplane melted away. All of that time pressed up against the fence in the front row at airshows over the last three or four years had paid off. I ran all of the pre-taxi checks and then eased the throttle forward. Inertia gave way and we taxied happily around the ramp. I took it slow, but delighted both them and me by adding a little throttle and inside brake to swing the tailwheel around at each turn. Then we taxied back to the starting point and whirled the tail around in a tight 180 before shutting down. “That was the coolest two minutes of my life!” shouted Cole. And it was a pretty cool two minutes of mine, too. I’ll get the kids up sometime. There’s no hurry, really. It’ll happen when it happens. And it’ll happen after continued demonstration of my competence, skill, and judgment as a pilot when Mary’s comfortable with the idea. But, in the meantime, it’s a really good feeling to know that the kids are excited about it and it’ll be a big thing for them when it happens. This is how it happens, folks. This is the magic of general aviation. The smell of 100LL, the sound of an engine, and the spark of imaginations on fire. Take your kids to the airport! I’ll see you there. This is a regular blog post. Please check the other posts if you’re looking for show notes or show audio. 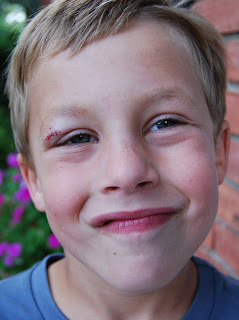 Airspeed first officer Nicholas (Cole) Tupper lost a battle with the swing set Sunday afternoon. Three stitches. Capt Force was nominated to take him to the ER. Actually, it was the fastest I’ve ever been in and out of an ER. Must have been a slow day. Good suture job (based upon my own very limited experience). He’s supposedly clear to get wet and otherwise do all the stuff he’s supposed to do at camp this week. We sent in the NASA event reporting form and don’t anticipate any calls from the FSDO. Although we’ll be ready if they call. I set up Cole with my old point-and-shoot digital camera this year and told him to go crazy and shoot whatever he wanted. This he did, shooting more than 400 pictures. Many feature his stuffed Koala bear, Jackie, but others are interesting, insightful, or just lucky, all in good measure. I downloaded a copy of Andrea Mosaic this afternoon, pointed the program to the directory containing Cole’s pictures, and let the program do its thing. The result is a mosaic of Cole by the iconic AirVenture entry gate with Jackie, made up of pictures that Cole took (or that were taken near him when I needed a basic camera to grab something or I had the telephoto lens on the Nikon and needed a quick wide-angle shot). Special thanks, by the way, go to the Flight Line Radio guys, who used their Gator to give Cole an assist in getting Jackie down from the roof of one of the forum buildings while I was recording Podapalooza with the panel! Being that Jackie plays such a prominent role in these pictures, I can only imagine how important the stuffed little guy is to Cole. Thanks, Flight Line Radio! This is a regular blog post. Looking for show notes or show audio? Please check out the other posts. This shot isn’t particularly well-composed or in focus, but I think I like it. 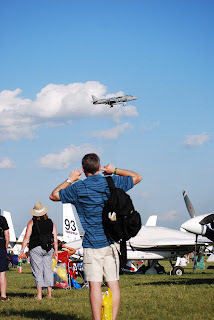 The Harrier demo is usually among the loudest at AirVenture. Here it is hovering in front of the crowd and there’s this guy with his fingers in his ears. Okay, maybe I’ve blown out my ears with too much rock and roll, but I come here for the noise. Maybe it’s that this guy visually tells the story and gives the photo the noise element that the visual aspect can’t. Anyway, I like it. 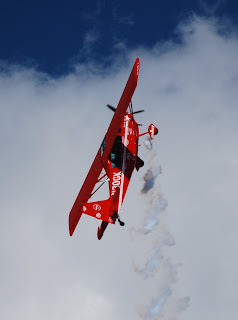 I’ve seen Gene Soucy three or four times and, much as I continue to expect that some other aircraft is going to thrill me more, Gene’s ShowCat is just phenomenal every time. I saw him perform at Battle Creek in 2006 with a 1,000-foot ceiling – one of the few acts that could or did go up that day. Flying his heart out in a machine that made really wonderful noises and that is featured on the “Shut Up and Listen to the Airplanes” episode. I also love that he turns toward the crowd to give you angles like the ones in these pictures. And either his smoke generator is oversized or he’s flying more slowly. Either way, his smoke trail is really thick and, in good light like we had today, it’s really dramatic. That’s Theresa Stokes on the wing. I’m not fan of wing walking. I get the willies watching someone get out there and do something that depends for the thrill on the danger of the activity. I love to watch flying because it’s beautiful and graceful and can be done safely with the right precautions. I don’t think there’s anything in the pose or anything else in wing walking that adds much to the flying. I guess the defiant gesture in the shot here is pretty dramatic . . . I’m torn. Can I say this without anyone thinking that I’m beating up on Theresa (or Gene)? I’m not. I met Theresa two years ago and she’s really together and is very good at what she does. And she’s an accomplished visual artist, too. 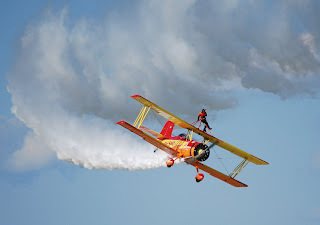 And wing walking is a time-honored barnstorming tradition. 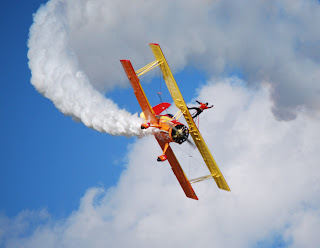 But wing walking just isn’t my cup of tea. Doesn’t mean I won’t have the camera out and ready whenever she’s on the wing. And doesn’t mean that I’ll never get it. Just trying to reconcile what seems to be heresy when I actually type it. More when I can get out on the net again. Connectivity here is really awful. Haven’t been able to get on the WiFi since I’ve been here. And haven’t talked to anyone who has. And AT&T connectivity for wireless web is awful during the day. Couldn’t even tweet for most of the day, much less check e-mail. Kent suggested that it’s all of those iPhone users who had to take the AT&T service and who then descended on Oshkosh. I don’t know. I was a Spring customer last year, but didn’t depend as much on Internet access on my prior Blackberry device. Anyway, it’s a little frustrating to be here with all kinds of content oozing from every crevice of the grounds and not be able to get any of it out without really working at it. I guess that, if you see these posts, it’ll mean that there’s at least some means by which to connect. Follow me on Twitter as StephenForce! And shoot me a friend request on myTransponder.com! Beta invitations are available from rod@myTransponder.com. I’ve already set up groups that address some of the things that you guys tell me you like best about the show, including Gooney Birds and Aviator Musicians, but it’s always better when you guys add your own thoughts, pictures, tips, and other content. Be a part of the rising tide that will give pilots and other aviation enthusiasts a genuine and authoritative community designed by pilots for pilots! 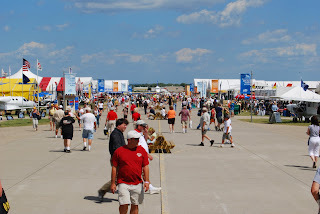 First full day at OSH! Every kind of people and every kind of airplane! I keep forgetting how much I love this place. I gathered and submitted three pieces for EAA Radio. One was a Dan Gryder DC-3 student talking about his type rating trip from Griffin, Georgia to Oshkosh and back. Then I got LtCol Frank Alvarez, a KC-135 driver from the Wisconsin ANG. Lastly, although it took more then four hours to coordinate, I got Bob Cardin, the man behind the extraction of Glacier Girl from her icy home of 50 years. 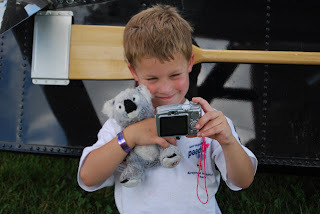 Cole spent most of the day taking pictures of Koala, his stuffed koala bear buddy, in nearly every aircraft on the field. It made for some slow going around the field, but he’s very into his project and I think it’s cool that he’s taking it so seriously. Here he is under a Husky floatplane doing a self-portrait. 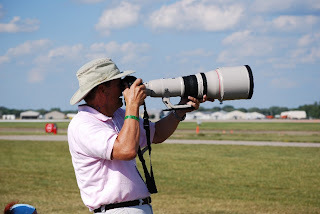 I found out that Canon will lend you these huge lenses to go shoot the airshow. And here I thought that this guy was just making up for something. Alas, I’m a Nikon guy, mainly because that’s what Costco was pushing the week that I decided that I needed more than just a point-and-shoot for the show. It seems that about one in 50 of my shots with the 200mm lens is usable. The auto-focus just doesn’t want to lock onto airplanes, so I’m focusing manually. And I still blur the overwhelming majority of them. Not going to stop me from taking pictures, though. Here’s a nice one that did work out. Not sure, but the rumor is that Lucas sponsors him. I had Airspeed Aerobatic Team tee shirts made up a few months ago, mostly as a lark. 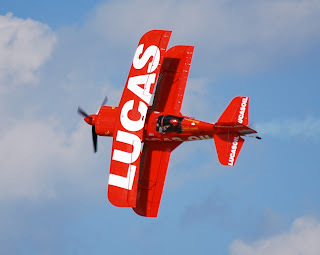 I actually felt a little disingenuous making them up because I wasn’t really an aerobatic enthusiast at the time. 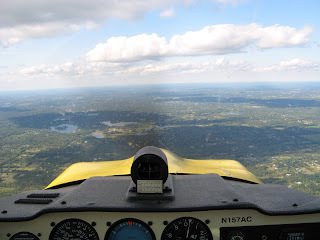 But after the July 8 session in the Citabria, I really think I like aerobatics. It gets the goosebumps going again. At the very least, you should find a qualified instructor and certified airplane and go do some upset recovery and spin training. And get a loop or two in just for fun. You might find that you like it. You may even find it addictive. I thought that all of that “I need my vitamin gee” stuff was bravado and hangar posing. But it’s not. Not most of it, anyway. It’s genuinely wonderful stuff. Is there no end to the wonder of flying? Are we not the luckiest generation in history?